BICC Press/Events/International conference \ Stabilization—For Whom and to What Ends? You are here: Home » Press » Events » International conference \ Stabilization—For Whom and to What Ends? International conference \ Stabilization—For Whom and to What Ends? BICC invited to the international conference "Stabilization—For Whom and to What Ends?" 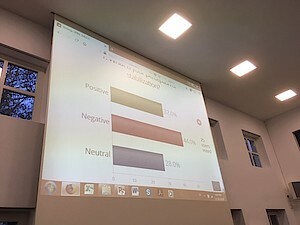 on 20 November 2018 in Bonn. 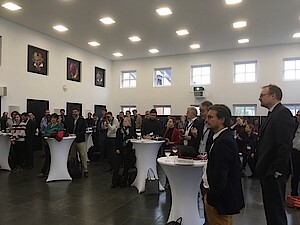 This conference brought together around 80 practitioners and academics working on issues related to stabilization in contexts of violent conflict to critically examine the concept(s) of stabilization and to reflect on risks and benefits of stabilization measures in practice. Among other things, the conference discussed the understanding of stabilization, how it works in practice and whether the growing significance of stabilization implies abandoning support for democracy and human rights. 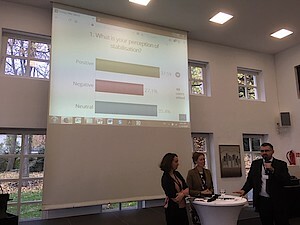 A poll expressed the perception of "stabilization" of the conference's participants (beginning and end of the conference). 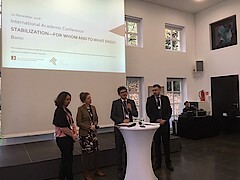 The conference was sponsored by the Foundation for International Dialogue of the Savings Bank in Bonn and the Deutsche Stiftung Friedensforschung (german foundation for peace research).